India Men grooming market is growing at healthy rate year-on-year. Within the market, personal care segment is registering positive growth on account of increasing adoption of grooming solutions, surging consumers spending and improving standard of living. Further, with surging purchasing power, need for looking more attractive and growing consumer awareness, men grooming market in India is likely to register higher India men grooming market forecast period revenues over the coming years. Over the past few years, the consumption pattern for grooming products among male population registered higher demand attributed to increasing ambition among male population. According to 6Wresearch, India men grooming market size is projected to grow at a CAGR of over 15% during 2017-23. In terms of market revenues, shaving products, fragrances, and deodorant segments captured substantial India men grooming market share in 2017. Further, toiletries segment registered least revenues in India's men grooming market. However, with increasing adoption of skin care, hair care, and bath & shower products, the segment is forecast to record higher growth during 2017-23. 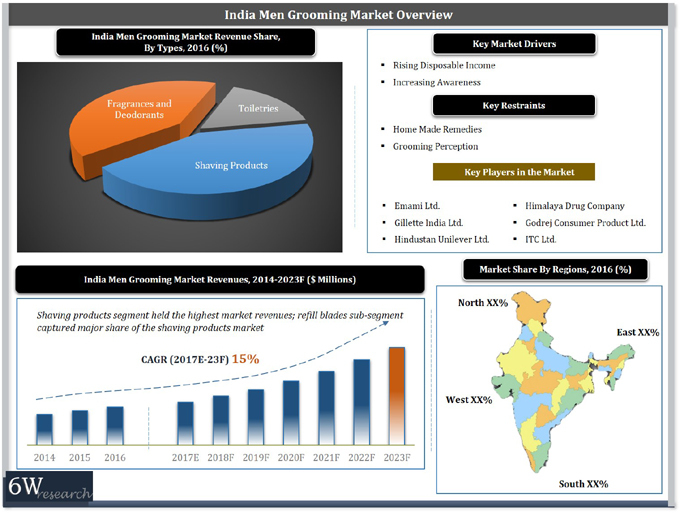 India men grooming market report thoroughly covers the India men grooming market by segments and regions. The India men grooming market outlook report provides an unbiased and detailed analysis of the India men grooming market trends, opportunities high growth areas, market drivers which would help the stakeholders to device and align their market strategies according to the current and future market dynamics. 13.3	Mcnroe Consumer Products Pvt. Ltd.
13.5	J. K. Helene Curtis Ltd.
13.7	Godrej Consumer Product Ltd.
13.9	Nivea India Private Ltd.
13.11	Vini Cosmetics Pvt. Ltd.